Get Prepared for the IELTS exam. Improve your reading, writing, speaking and listening with these online courses and materials. In this blog I’ll be discussing some of the best paid and free courses and books and materials available to IELTS candidates that want to improve their chances of getting the band they require. We at IELTS MOOC believe that the best way to improve your English in general is read as much as you can, practice speaking at every opportunity, and listen to English language audio or watch movies and television shows. However, to really maximise your chances to do as well as your ability allows in the test itself, these paid and free courses and materials will help you understand everything you need to know about the test, giving you confidence and improving your ability to speak, read and write too. Let’s look at some of the best paid courses first. (Courses are listed in no particular order) While, of course, paid courses are not free, these may be a good option if you are already paying for classes or one-to-one tuition. These courses are often very helpful in giving you good advice on what to do in the test or while preparing for it. They often feature good videos, audio and practice and can ultimately cost you far less than classes or tuition. Though we would not necessarily recommend you forego these options for some online courses. Online courses to understand what you need to do and then practice in the real world with other learners and friends is an excellent way to prepare for the IELTS test. With paid courses, it’s not always the best idea to get one course that covers everything in the IELTS test. Sometimes you can consider courses that allow you to concentrate on whatever it is that you feel are your weaknesses. If you think you are weakest in your writing but your listening, speaking and reading are strong, you might be best advised to choose a course that is focused purely on writing. Likewise you might feel that you are strong in all areas except reading, then you might benefit from focusing on that skill alone. 1. Magoosh is one of the most highly recognisable online IELTS preparation websites and for good reason. 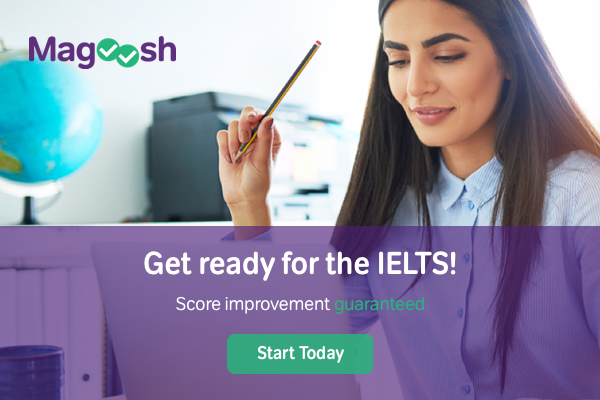 Magoosh offer over 125 lessons on all aspects of the IELTS test including videos that help learners understand strategies to improve their scores and avoid making mistakes. There are 650 practice questions to test your understanding and prepare for the test as well as a team of remote tutors who will answer learners’ questions by email. Magoosh also offers a 7 day money-back guarantee if learners do not like their product and offer a score guarantee where Magoosh will give you a full refund of your course costs if you fail to improve your score by 0.5 points. Please visit the Magoosh website for further terms and conditions. Udemy is an excellent website for this. Udemy features a huge variety of courses that focus on particular skills as well as courses that look at the test in its entirety. Another good feature of Udemy is the scoring system. Learners that have previously taken the course can give scores and, therefore, new learners can choose the courses that have had the best overall scores. Learners should look for Udemy courses that have high scores of 4/5 and above from a high number of students. It’s no good picking a course with 5 stars if only 3 learners have left reviews. 2. Mastering IELTS Writing: Task 2 (Achieve Band 7+ in 5 Hours) is a 5 hour video course by Matt Rainsbury. The course has an excellent score of 4.5 from over 3000 learners. The course focuses on the most important part of the Academic Writing Test, Task 2. After taking the course, learners will be able to approach any of the different types of tasks that may arise in the IELTS test. The course gives guidance on how to structure essays, write coherently and cohesively, and use vocabulary that best communicates their ideas in a clear and easy to understand manner, helping the candidate get as good a score as possible in this very important part of the writing test. 3. IELTS – Prepare for IELTS Speaking by Former IELTS Examiners is a 17 hour video course that has been created by former IELTS examiners and gives learners an insight into what IELTS examiners are looking for in the IELTS speaking section. The course has an excellent score of 4.7/5 from over 2500 learners. After taking the course, learners will be able to use useful phrases and adapt model answers for a number of IELTS speaking part 2 topics, have an increased vocabulary to draw on, and be far better able to approach the IELTS speaking test with confidence. 4. IELTS Band 7+ Preparation Reading Course is a well reviewed (4.2/5 from 129 reviews at time of writing) guide to learning how to answer IELTS Reading comprehension questions. It features 9.5 hours of video and downloadable resources. After taking the course, learners will be able to understand what to do with each type of IELTS reading question, use strategies to improve their chances of success, and get access to practice tests With explanations of each answer from the teachers in the videos. 5. IELTS Preparation Masterclass: A Complete Guide to the IELTS is a 5 hour on demand video that covers all aspects of the IELTS test. It has an excellent rating of 4.4 from over 300 learners and is designed to give all the required information about the ILETS test as well as a wealth of tips for preparation from an IELTS specialist. Learners will, once they have completed the course, be able to understand the IELTS test fully, know how best to prepare for the test, and understand what it is they need to do before and during the test to maximise their chance of getting the best score they can. 6. IELTS Band 7+ Complete Prep Course offers a huge 53 hours of video and 49 downloadable resources covering all aspects of the IELTS test with a rating of 4.2/5 from almost 5000 learners. The course offers learners the opportunity to learn to apply IELTS strategies to confidently approach all parts of the test and know what examiners are looking for from the speaking and writing sections as well as know how how to avoid the tricks and traps of the reading and listening sections. There is, of course, a wealth of free courses and materials available on the Internet and below we’ll detail a few we at IELTS MOOC believe are worth considering. 1.The IELTS Academic Test Preparation by The University of Queensland is a Massive Open Online Course available on the edx.org platform that is a free to study online course that takes 8 weeks at 5-10 hours per week and is suitable for anyone that wants to understand and prepare for the IELTS Academic test. Learners who complete the course will be able to understand the IELTS test procedure and format as well as useful test-taking strategies and skills. 2. Understanding IELTS: Techniques for English Language Tests is another Massive Open Online Course by the British Council, one of the organisations that organise and conduct the IELTS test. This course gives learners the opportunity to improve their English and prepare for tests, such as IELTS reading, writing, speaking and listening. It’s 6 weeks in duration at 2 hours per week. Learners can upgrade from the basic version of the course to full access course for £42. IELTS Liz is an excellent website full of resources and advice for IELTS learners covering all skill areas and information on the test. IELTS Simon is another excellent resource for IELTS learners that features daily updates of materials and advice to help IELTS candidates prepare for the IELTS test. Disclosure: Some of the above courses are affiliate links others are not. They should not cost you a penny more and they help us keep the lights on!